So You Want to Learn Portuguese in Lisbon? You’ve decided that you want to learn European Portuguese and, more importantly, you want to learn Portuguese in Lisbon, but where do you begin? There are so many different language schools in Lisbon, how do you know which school is the best? Should you take an intensive course or would it be better to take classes during the week? Deciding to do something like study Portuguese in Lisbon sometimes just seems to throw up more questions than answers but, hopefully, this guide will steer you in the right direction. Learning Portuguese on a budget? If you’ve already decided that you’re coming to Lisbon to study Portuguese, the next question to ask yourself (if you haven’t already) is whether you want to take an intensive course or to study Portuguese over a longer period of time (often language schools call this an “extensive course”). If you aren’t living in Lisbon, don’t plan to, and are just visiting, the answer is probably going to be an intensive course. If you have moved to Lisbon and have the opportunity to do either (not everybody has the time to take an intensive course), then you’ll need to weigh up your options. Extensive courses are the most popular choice for people living in Lisbon but, even if you decide to study Portuguese in Lisbon over a longer period of time, your Portuguese learning should probably have some level of intensity to it. You don’t necessarily need to take 4-8 hours of lessons per day, but you should at least be studying Portuguese on a daily basis – ideally with speaking practice as a regular part of that. 1-to-1 tends to be the most effective way of learning a language, but there are many reasons that people choose to take a group class instead. The first reason is price: private lessons are more expensive than group classes, and range from around €10 per hour to €30 or more per hour. The second reason is intimidation: A 1-to-1 class really puts you on the spot, and means that you’ll be getting the teacher’s complete attention. This is obviously a good thing, but many people can find it intimidating. The third reason is the social aspect: Language classes can be a good way to meet other people, particularly those who are new in Lisbon, and that isn’t something you get when you take 1-to-1 lessons. If you do decide to take group lessons, make sure they happen several times per week or more. The more regular the classes, the more likely you are to learn Portuguese. Note: you don’t have to completely choose one or the other. It’s possible to mix and match. You could start with an intensive course and join an intermediate group class once you have the basics. Alternatively, you could self-study initially (it’s possible to learn Portuguese almost entirely online) and, once you feel you’ve reached a decent level, join a more advanced class. Alternatively again, you could get the basics in a group setting and then start taking a more intensive course once you feel more comfortable. The following are just a few of Lisbon’s many language schools, all of which offer extensive Portuguese courses in Lisbon. Intensive Portuguese courses can be the most effective way to learn a language as they are much more immersive and really push you to both study and practice. As you’ll be practicing and studying every day, you also won’t have big gaps in between your lessons. This means you’re much more likely to retain what you learn, and also learn the language a lot faster. Some people come to Lisbon for a “language learning vacation” while others take an intensive course when they first move here. If you choose to take a group class, you’ll meet both types of people in your class. 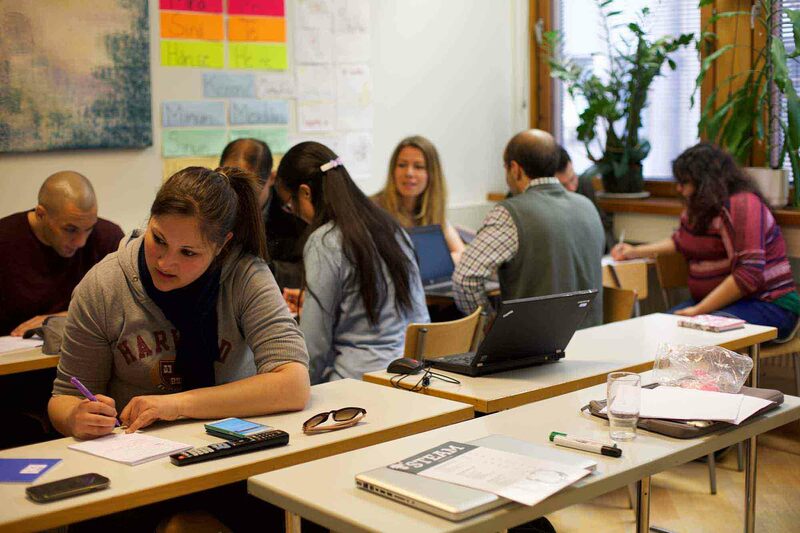 The following are just a few places that offer intensive courses in Lisbon. PPT Program – Portuguese for All – A free and reasonably intensive course for immigrant residents in Portugal, “Portuguese for All” offers courses in A2 and B2-level European Portuguese. The courses normally take place over several months, with classes several times per week. As well as Lisbon, the PPT Program is normally also available in Porto and Faro. Escola de Línguas das Sardinhas – Offers intensive courses that correspond with each level of the Common European Framework of Reference for Languages (A1, A2, B1, etc). Each course takes around 40 hours and takes place over 2 weeks. Erasmus+ Programme at Universidade de Lisboa – A very affordable initiative from the Universidade de Lisboa that offers several intensive and extensive courses for Erasmus+ students in Lisbon. As well as offering group classes, most language schools (like those listed above) offer private face-to-face lessons as well. There are also independent Portuguese teachers who offer conversational or curriculum-based lessons in Portuguese, and these teachers are typically cheaper than teachers who are connected to a language school. Unfortunately, finding private teachers isn’t particularly easy particularly if you’re looking in Google. You’ll probably need to ask in any of the many Lisbon Facebook groups for expats and internationals. One of the benefits of 1-to-1 lessons is that you can decide how many lessons you want per week, depending on whether you want to study Portuguese intensively or extensively. It’s a lot more flexible than a group learning situation, where the number of classes and timetable are very set in stone. Note: A lot of people living in Lisbon actually take lessons over Skype rather than face-to-face, and often it’s easier to find someone that does online lessons rather than in-person lessons. Learning a new language isn’t cheap. Language schools are expensive and living in Lisbon can also be expensive, particularly if you’re staying here short-term and living in a hotel or apartment. Together it all adds up, and can make the dream of learning Portuguese seem impossible. Don’t worry: there are a few ways to keep the costs down. Choose group classes over 1-to-1 classes, as these often cost as little as €5 per class. Get the basics yourself by taking an online course that covers A1 or A2 Portuguese (costs less than €100) and combining that with regular conversational lessons with a Portuguese teacher (normally €10-20 per hour). SPEAK, an cultural initiative as opposed to a language school, offers incredibly affordable beginners and conversational Portuguese classes in Lisbon. Find a tandem partner who is a native Portuguese speaker and who wants to learn English (or your native language) and is willing to meetup and swap languages. Find an online teacher through Italki, where teachers are often as much as a third cheaper than those in Lisbon. Private, independent teachers are much cheaper for 1-to-1 teaching than those that work through a language school. Think about learning Portuguese somewhere other than Lisbon where rental prices or hotel prices are likely to be lower. The Algarve, for example, can be very affordable in winter. The best part of being in Lisbon, aside from having access to different Portuguese classes and teachers, is being able to practice Portuguese on a daily basis. You’ll get to practice in shops, restaurants, and cafés, and you’ll also have access to Portuguese speakers living nearby. Here are just a few different ways to get some practice in while you’re here. Language Exchange Meetups: There are several language exchange meetups in Lisbon, most of which are listed on meetup.com. Tandem/Language Exchange Partners: Find a Portuguese-speaking friend who’s learning English and swap your English for their Portuguese using sites like Open Language Exchange or My Language Exchange. You can also find online tandem partners using the Tandem app. Homestays or Portuguese flatmates: Rather than live by yourself, with other expats, or in a hotel or Airbnb, live with other Portuguese people. Rent a room in Lisbon or find a homestay where you live with a Portuguese family. Just because you’re living in Lisbon, that doesn’t mean that you can’t self-study Portuguese here. There are a number of free resources and online courses that cover beginner and intermediate Portuguese, some of which are even correspond to A1 or A2 level, that you can get a hold of and begin studying straight away. In fact, it’s possible to study Portuguese from beginner to fluency entirely online. Of course, it makes sense to take advantage of the fact that you’re living in Lisbon. You may be able to learn a lot of the vocabulary and grammar yourself, but take advantage of the fact that you have access to teachers and tandem partners locally who can help you with your spoken Portuguese.